Could The Decision in Floyd vs. New York Have A Bearing on Municipal Schools in Shelby County? person the equal protection of the laws. It prohibits intentional discrimination based on race. In other words, if I read Judge Scheindlin right, when a “facially neutral” law or policy has been applied in an intentionally discriminatory manner, it is illegal and unconstitutional. And the only proof needed of discriminatory intent is that the “impact” of the official action bears more heavily on one race than another. So the “facially neutral” municipal schools law in Tennessee may be found to have been applied in a biased way if it results in Black students being isolated in an all-Black school district. And the plaintiffs would need prove only that the municipal district adversely impacted Black students in Shelby County more than whites. Does the formation of municipal schools in Shelby County violate Federal court orders pertaining to the rights of Black children to attend integrated schools? It certainly seems to, based on this quote from the Supreme Court’s holding in Cooper vs. Aaron (1958): In short, the constitutional rights of children not to be discriminated against in school admission on grounds of race or color declared by this Court in the Brown case can neither be nullified openly and directly by state legislators or state executive or judicial officers nor nullified indirectly by them through evasive schemes for segregation whether attempted “ingeniously or ingenuously.” Smith v. Texas, 311 U. S. 128, 311 U. S. 132. Now it is obvious that the formation of municipal school districts is not a DIRECT attempt at nullifying Brown vs. Board of Education. But it is the second phrase that is more concerning- “nor nullified INDIRECTLY by them through evasive schemes for segregation whether attempted “ingeniously or ingenuously.” In other words, in the light of Cooper vs. Aaron, actions that would ordinarily be perfectly lawful and constitutional are not if they result in school segregation. And the courts in my opinion cannot merely look at how diverse the new municipal districts would be. By that standard, Millington, Bartlett and Germantown would likely pass constitutional muster, although I still am not sure how many of those communities’ current Black students actually reside in those towns. Arlington, Lakeland and Collierville will likely run into problems on the diversity issue within their own districts. But courts in the past have also looked at the effect the new districts would have on the district that is being left behind, namely the Shelby County Schools. And nobody has denied that the net effect of the new districts will be to leave SCS almost entirely Black and Hispanic, which is a clear violation of those children’s rights under Brown vs. Board and related cases, including Northcross vs. Memphis Board of Education. 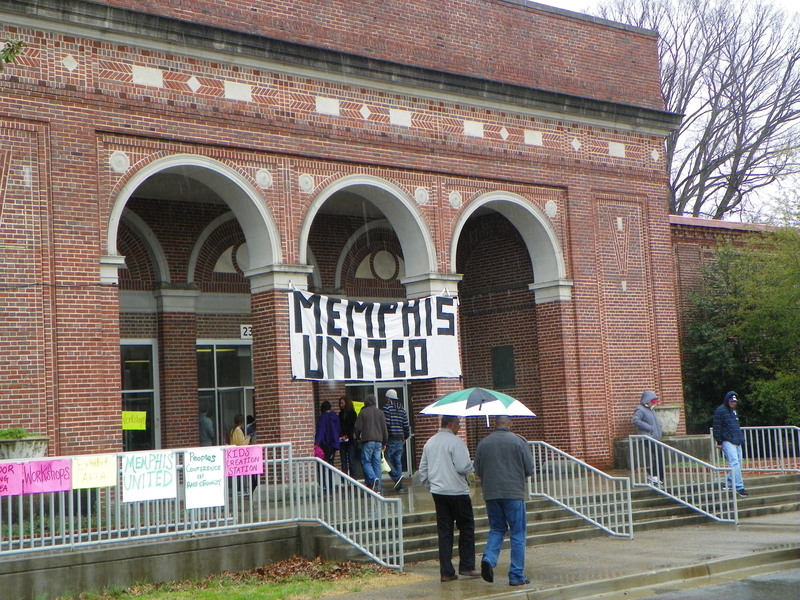 The municipal district supporters claim their motives have nothing to do with race, and if that indeed is the case, they should be prepared to prove it in court, not only by agreeing to allow all students who currently attend suburban schools to continue to do so, but also by agreeing to allow a certain number of inner city Memphis children into the new districts. Both would greatly increase the likelihood of Federal court approval for the municipal districts. But I doubt that suburban residents will support either, particularly when a certain Arlington municipal booster is making threats to limit enrollment to Arlington residents only unless their district is given the school buildings for free. At the well-meaning Heart of Memphis rally Saturday morning, speaker after speaker praised those of us who had braved the weather to show a different set of values than the Ku Klux Klan. “You are the true heart of Memphis,” was said more than once. Unfortunately it was all wishful thinking, and on Monday, the county commission meeting revealed the bitter truth about the real “heart of Memphis.” After an observer pleaded for a referendum in the county to abolish the residency requirement for all public school teachers, Commissioner Walter Bailey said that would allow outsiders to “absorb” jobs that should go to county residents. Commissioner Terry Roland saw fit at that point to remind his colleagues that he can go to the Republican-controlled state legislature and get the residency requirement overturned. That was followed by Commissioner Henri Brooks complaining that she had been disrespected by her white colleagues on the Commission, comparing their actions to the Ku Klux Klan. So, it is past time that we halt any absurd notions about peace, love or brotherhood being the true heart of Memphis. If it were, we would elect leaders who exemplify those values in their public lives. It is no accident that the KKK repeatedly comes to Memphis to stage rallies. They know fertile ground when they see it. It’s absolutely amazing to watch a lot of suburban and out-of-town residents object to the renaming of Confederate-themed parks in a overwhelmingly Black city that many of them abandoned years ago and wouldn’t think of moving back into now. Why would you care about what a city where you used to live names its parks? Ultimately, if it is really that important to them that Memphis honor the founder of the Ku Klux Klan with a park name, they should move back into the city so that they will have a vote and a legitimate say-so. Otherwise, they should be quiet. The existing names of Jefferson Davis Park, Confederate Park and Forrest Park are offensive to probably as much as 85% of the current residents of Memphis, and they should not be forced to accept this because of the opinions of people who no longer live in Memphis or never did. Recently the Commercial-Appeal printed an editorial about soon-to-be-implemented changes that are coming to downtown parking. The newspaper gleefully reported as progress that Memphis will replace the old-fashioned coin parking meters with sophisticated newfangled meters that can accept credit cards. Of course, the quid pro quo for this, said the editorial, is that there will be no more free parking downtown after 5:30 PM, nor on weekends, nor on holidays. So this “progress” so hailed by the CA is actually a tremendous step backwards for the city of Memphis. How quickly our leaders have forgotten that the cost of parking is one of the things that helped kill downtown Memphis in the first place. Shoppers no longer saw the point of driving downtown and paying for parking to shop at Goldsmith’s or Lowenstein’s when you could go do that at one of the new suburban shopping areas, where parking was provided for free. The other thing that killed downtown Memphis was that people didn’t feel safe, particularly after several spates of downtown rioting in 1968-1969 and again in 1971. And on that point we have Friday’s incident where students at the All-West Tennessee Band and Orchestra Convention at the Cannon Center were beaten and robbed outside of Huey’s directly across from the Peabody Hotel. So Mayor Wharton and other city leaders are essentially saying, “Come downtown and spend money, but we’re going to sock it to you for parking 24 hours a day, 7 days a week, and you might get robbed to boot.” Who likes that proposition? Anyone? The Cleaborn Homes public housing development was built in Memphis in 1955. The Memphis Housing Authority began demolishing it in April this year. The powers that be are telling us that this is improvement, that those forced to leave will be better off, and that the new beautiful development for higher-income people that will be built will be better for Memphis. But is there any real gain in tearing down people’s neighborhoods and communities? What good actually results? We are told the buildings are old, in which case they could have been rehabilitated or completely replaced, but with the original residents given first priority to be allowed back in when the new construction is completed. We are told the area is overcrowded, but the reconstruction could have been designed to lower density. We are told that the area has become a crime problem, without any regard for the impoverished living conditions that fuel crime. In fact, the mass displacement of these folks may trigger more crime, as their cost for housing, even with vouchers, will be far more significant. In short, while redevelopment advocates have perhaps shown why the old buildings need to be torn down and replaced, they haven’t shown why the original residents must be uprooted and moved to other areas of the city. The reasons for THAT they’d rather not touch with a ten-foot pole. And so the memories of more than 50 years come crashing down at the behest of a heedless monster machine called greed and progress, banished to live only in the mind, faded photos and a couple of t-shirts. All “progress” isn’t forward. #1. Safety of the citizens of Bartlett: No one can argue that there is no alternative to Bartlett police serving warrants on people in other jurisdictions. Memphis police or Shelby County sheriff’s deputies are available and willing to do this for Bartlett. While Bartlett officers are out in another jurisdiction serving warrants, there are fewer officers inside of Bartlett keeping us safe. Our officers should stay here protecting Bartlett, which they are paid to do, and leave the serving of warrants to the duly-constituted law enforcement agencies of the jurisdiction where the suspect lives. #2. Liability: The city of Bartlett (and thus its taxpayers) is legally responsible for the actions of its police officers. Thus, if someone is killed while the officers are outside the jurisdiction of Bartlett, and the officers’ actions are found to be negligent, the taxpayers will be stuck with paying out a large settlement to the victim’s survivors. #3. Safety of the officers themselves: Defenders of the Bartlett policemen’s actions yesterday keep pointing out that the incident could have ended the other way, with the suspect shooting and killing the officers. Although Bartlett police face this risk within the city of Bartlett also, they face a greater risk when taken into other jurisdictions where they have less familiarity with the surroundings and less experience. It cannot be argues that policing Bartlett and policing North Memphis are the same. Clearly, Memphis police would better know the neighborhood, and have a better chance of serving the warrant with everyone coming out alive. #4. Avoiding negative publicity and controversy: The Memphis metropolitan area has a problem with racial conflict and racism. It annoys most of us, but there seems to be no easy way to solve it. For better or for worse, the Bartlett police (like other suburban districts) have developed a reputation for being racist. It ultimately does not matter whether that reputation is deserved or not, since it is the opinion of most Black Memphians that I know. If the Bartlett police go into Memphis and kill a suspect, the incident immediately takes on racial overtones that it would not if a sheriff’s deputy or Memphis policeman had to kill a suspect, even if it happened while serving a warrant for Bartlett. Given the above argument, I think that those of us who live in Bartlett should ask Mayor McDonald to order a change in the BPD’s warrant policy. It will ultimately be in the best interests of everyone involved.